Following the failure of the English Hawker P1081 to meet both RAAF and RAF requirements, Lawrence Wackett turned to the USA in search of a design for local production, and once again selected a North American Aviation design to be built by CAC. Although the F86 Sabre was already acknowledged as a successful aircraft, Wackett proposed to Rolls Royce that the Sabre be fitted with the Avon, with 50% greater thrust than the original engine, which was presently being tooled up for production by CAC for use in the Australian built GAF Canberra. Other modifications included replacement of the six 50 calibre machine guns with two 30mm Aden cannons, and although the resulting aircraft still has the classic looks of the F86, the fuselage required 60% of the fuselage structure to be redesigned. Not obvious to the eye is the 25% increase in the air intake to meet the different needs of the Avon engine. Known originally as the Avon Sabre by its manufacturer CAC and in service with the RAAF, one CA-26 prototype and 111 CA-27 production aircraft were manufactured from 1953 to 1961, and the type remained in service with the RAAF until 1971. Interestingly, the Avon Sabre became the fourth Australian made aircraft to service with overseas forces, following the Wackett Trainer, Tiger Moth and Mosquito, when the Australian government presented operational Sabres to the air forces of neighbouring Indonesia and Malaysia. 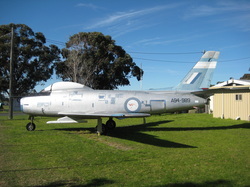 Our aircraft last served with No 5 Operational Training Unit, where it crashed near Williamtown NSW in 1969. Consigned to the fire dump at Point Cook, it was disposed to a private owner in 1972, and was acquired by the Museum in 1982. Since that time the stripped airframe has been completed using parts of Sabres found all over Australia.